Teachers and education staff worldwide are building education workers power through unions and political organizations. On World Teachers Day 2018, Commission 11 of the International League of Peoples’ Struggle and the international committee of the Alliance of Concerned Teachers (ACT) are celebrating the powerful unity being built by teachers across the world to win victories for education and fortify our solidarity with mass movements. Our painstaking efforts at building sectoral unity and our patience in linking and raising our struggles with the global anti-imperialist and anti-fascist movement of peoples have enabled us to gain strength and sustain our campaigns for protracted struggles ahead. Filipino teachers—one of the lowest paid in the world—are contributing to the global call to increase the salaries of education workers. Despite heavy workloads and meager salaries, filipino teachers are mounting campaigns against oppressive working conditions in schools as exposed effectively in the regional ACT Union formations, the sole and exclusive collective bargaining agent of teachers and non-teaching personnel of the Department of Education. 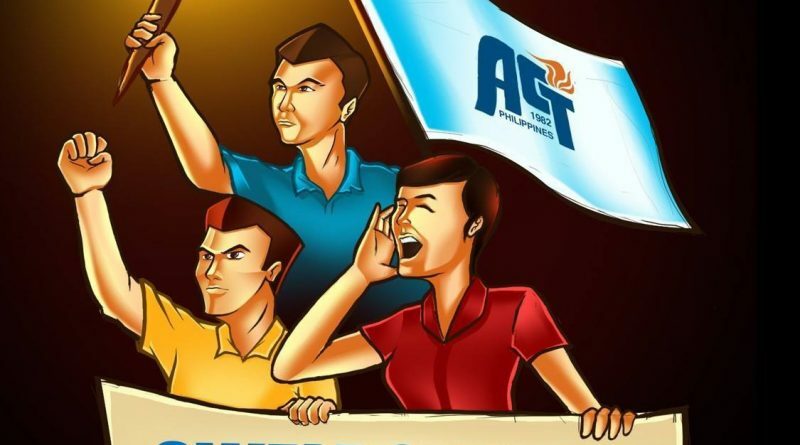 ACT Union members are also teachers who are allied with the broad formation of education workers in the Philippines, the Alliance of Concerned Teachers (ACT), a mass movement of teachers that took the lead in building both ACT Union and ACT Teachers Partylist, the voice of education workers in Phillippine Congress. These formations have worked together in forging solidarity with Lumad (indigenous poeples of Mindanao) Schools through curriculum construction, module-writing, and support for Lumad teachers and students who are currently being forced out of their communities under Martial Law-stricken Mindanao. Filipino teachers are also engaged in a process of continuous contienticization as we learn from the struggles of filipino workers of NutriAsia, PLDT, Jollibee, call center agents, workers in export processing zones, farm workers in multi-national companies and other ruling-elite-monopolized-land like Hacienda Luisita. Currently facing the most ferocious attacks on the filipino people by the US-Duterte regime, teachers are gradually relearning the ways and means of the national liberation struggle to which our very own students never tire to contribute all throughout the history of the anti-imperialist and anti-fascist movement in the Philippines. Commission 11 of the ILPS is with one with our fellow teachers across the world who have up the ante of unionism by staging work stoppages, huge marches and massive union recruitment. These painstaking endeavors which have gained public attention especially this year prove that teachers’ demands for an increased pension plan, retirement benefits, education budget, and regularization are unifying. These are campaignsemerging out of the political choices we make as union members who fight it out from our local districts to national and international union formations. For giving visibility to the struggles of educations workers this year, we honor and are deeply grateful to our beloved teachers from Tunisia and Algeria in Africa, Buenos Aires in Argentina, Chihuahua, Oaxaca, Chiapas, and Michoacán in Mexico, Carabobo and Valenica in Venezuela, Sao Paolo and Amazonas in Brazil Arizona, France, Scotland, West Virginia, Kentucky, Oklahoma in the United States and London in the United Kingdom for their splendid work of arousing, organizing and mobilizing education workers and the larger community against the ills of neoliberalism and its correspondent neofascist mechanisms. One of our shared and most glaring grievances with the working poor who constitute rising agrarian and industrial unrest worldwide is the fact that despite rising health costs and inflation cutting into our income, years had gone without a raise. Neoliberal edcuation managers do not care about us until they are threatened by our strong unity and bold resolutions to strike back. They continue to spread the biggest neoliberal managerial lie that adversely affect our lives and our families’ future: “To avoid higher inflation, keep expensive pay deals for both public and private sector workers.” The truth is that the accumulation of wealth by the global ruling elite fuels both inflation and slave wages for all working people. On World Teachers Day, as we celebrate our unity and honor our growing strength, we vow to reject the bankrupt neoliberal prophecy of economic trickle down. The wealth that we create is the wealth that we will share. No trickle down, only struggle! Happy World Teachers Day!